Stroke. 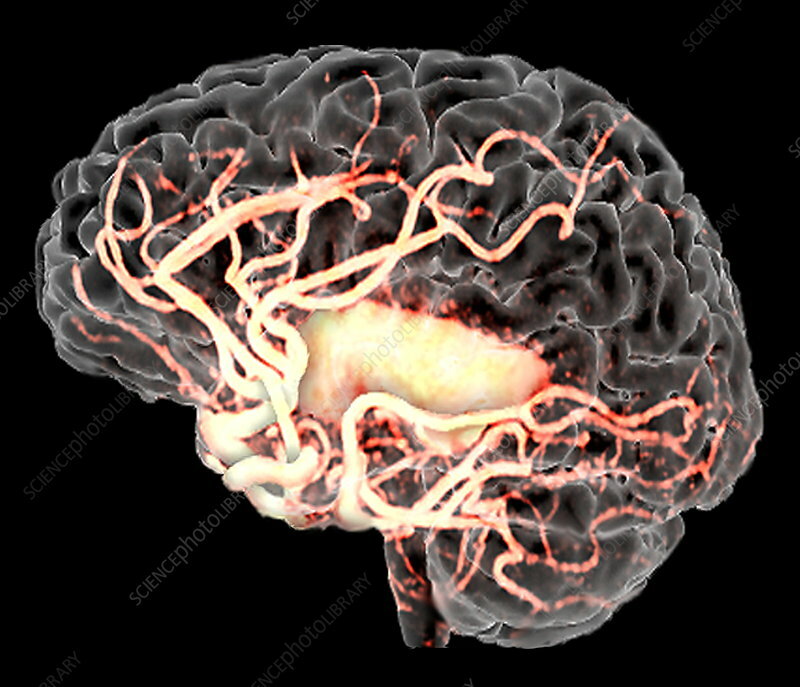 Coloured three-dimensional magnetic resonance angiogram (MRA) scan showing a human brain after a stroke, or cerebrovascular accident (CVA). Major arteries are white. The central region (yellow) is an area of bleeding, or haemorrhage. Stroke is brain damage caused by the interruption of the brain's blood supply, or by the leakage of blood through blood vessel walls. The two main causes are high blood pressure and narrowing of the arteries due to fat deposition (atherosclerosis). Strokes vary in severity, but can result in long-term paralysis, coma and death. MRA uses radio waves and a magnet to image blood vessels.